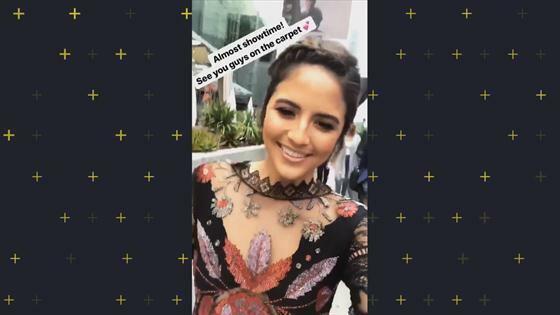 Getting ready for the Emmys 2017 red carpet is no easy feat. Just ask E! 's own Erin Lim, who happened to be attending for the very first time this year. Aside from picking out a best dressed-worthy gown and prepping for celeb interviews, the pro's biggest hurdle was getting around town stress-free. Her savior: Uber. That's right, no old-school limo service for Erin—she's just like you (minus the attending-the-Emmys detail, of course). For the special occasion, the host enlisted the very same car service you use to help you get around in your everyday life. Not only did Erin summon Uber on the big day to drop her off at the Microsoft Theater in Los Angeles, she also used it to travel to E! 's Countdown to the Red Carpet rehearsals, as well as to get last-minute makeup touchups ahead of the carpet. "My first Emmys experience couldn't have gone better: from my glam team making me feel like a princess, to the production team getting me so well-prepared, to having my mom by my side, all the way to the amazing surprise from my boyfriend Lamorne Morris. I seriously couldn't have gotten to and from home and rehearsals, and then to the big day without Uber. Shoutout to Uber getting my mom home safely after the show," shared Erin. For more must-see moments from Erin's first-ever Emmys (like selfies from inside her ride), relive the fun in her Instagram story above!